boxerfrogs – All Subscription boxes, ripped open, reviewed and sorted into nice little categories just for you. All Subscription boxes, ripped open, reviewed and sorted into nice little categories just for you. 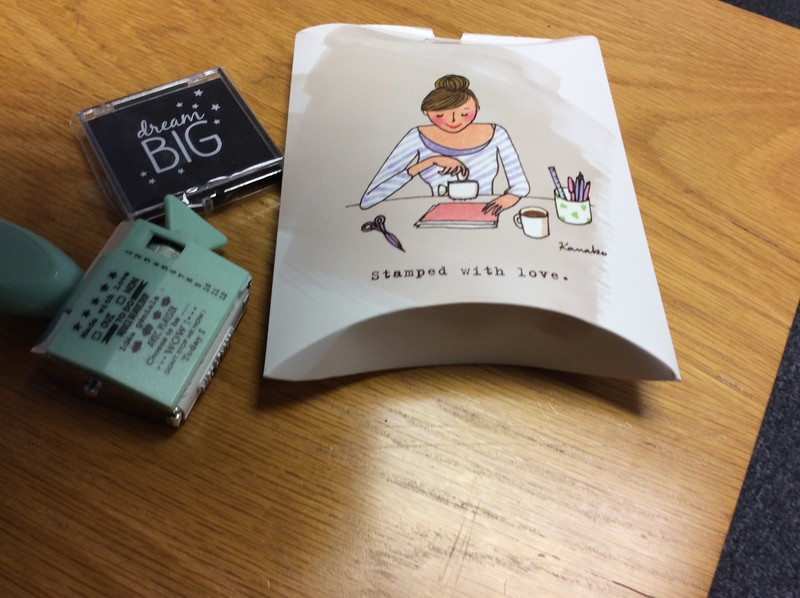 I have always been a bit fearful of Beauty Subscription boxes. I am not a girly girl as such but I do love a bit of pampering.But what if everything they send me is pink?! What if the make up doesn’t match my porcelain/snowman skin tone? So many questions that remained unanswered! So I took the plunge with My Little Box. 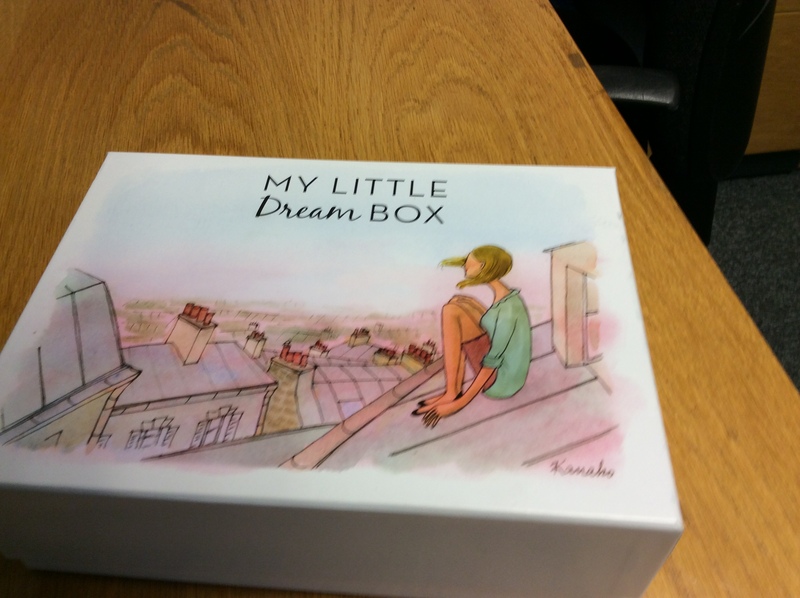 The Box is £11 a month and £3.95 P&P with a promise that the contents will be worth up to £65. The www.mylittlebox.co.uk site claims that each box will contain: Must-have beauty products (including one from their own in-house beauty range, My Little Beauty) , Fashion and lifestyle accessories , Their magazine (My Little World),Illustrated goodies by Kanako ,and other surprises… The subscription can be cancelled any time, however after receiving my box I don’t think I shall be cancelling any time soon…. Firstly, the box itself is lovely. The kind of box that you would keep to put trinkets in. As this months theme is “Dream” I may keep my cut outs in there from magazines of all holidays I SHALL go on one day,haircuts that I SHALL get and maintain and the perfect smoky eye look that I WILL perfect and not look like a low rent lady of the night. As I said, the theme is dream…. So upon opening this beautiful box I am greeted by a lovely card with a quote from Walt Disney telling me “If you can dream it, you can do it” I may keep this on my desk at work… Then a small beautifully decorated envelope, a lovely stamp inside “Stamped with Love” with 12 rotatable sayings in French and English, paired with a mini ink pad. This stamp shall come with me to work where I shall cover my entire male work office with whimsical sayings. I am going to keep the envelope for spare hair bands ( nothing goes to waste in this household) . 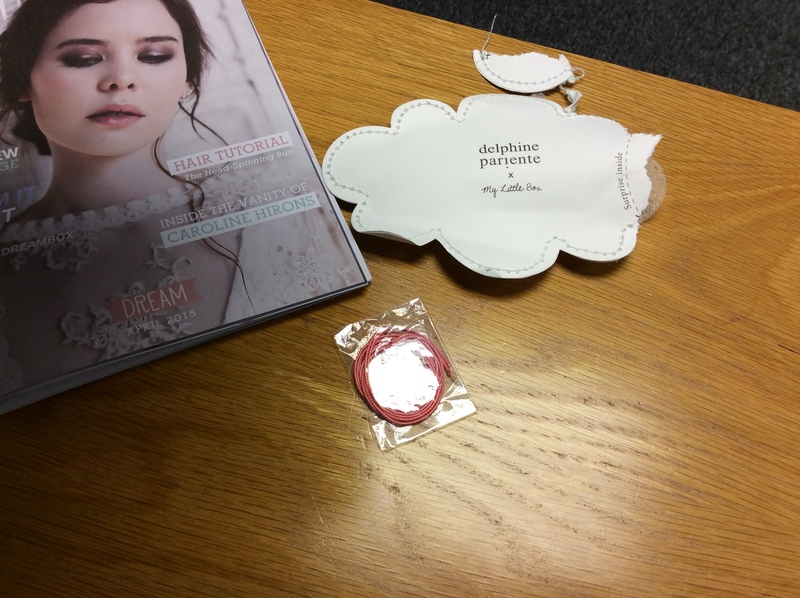 A little cloud comes next, that I really didn’t want to open as it was so dainty, however I tore it open with my oversized man hands and out popped a gorgeous little locket, perfect for the beach, designed by Delphine Pariente, reading “Lucky Star” a perfect summer day accessory. The My Little Magazine comes packed with advice, tips and tricks. Next inside a definite use again draw string bag, I find a repairing hair mask, my god I need a hair mask, just have a look at the You Tube review of the box and you will understand, this particular mask is from My Little Box’s own beauty range My Little Beauty. The packaging is elegant, it smells amazing and to my surprise it was a full size bottle at 100 ml. I then pull out Cowshed Wild Cow Invigorating Body Lotion, 100 ml. My skin is dry and flaky thanks to the Great British Weather and from the feel of this lotion it will be a perfect match for my snake like exterior. Next up is a lovely Loved by Lou Lesage Lip Balm, in a deep red tone, which glides on like a cloud off a unicorns behind. Perfect for those quick fix moments, or to me, every hour. I know I have gushed about this box and I apologise, in fact I don’t scrap that, it’s superb. Quality, class, elegance, this box has it all. This months contents came to £53, who could complain? Tell me what you think of My Little Box, are you a fan? What other boxes should I be trying out? Have a look at the You Tube Video here. A feast for the eyes isn’t it? 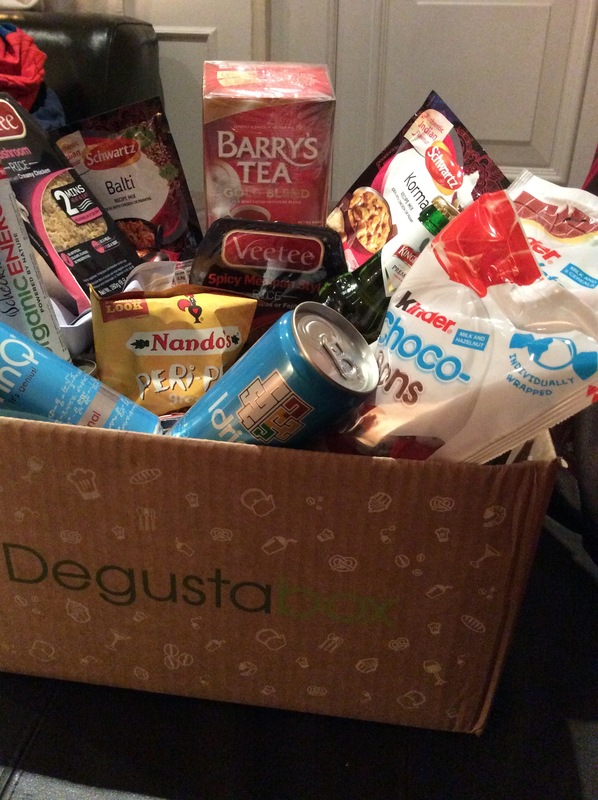 Degustabox is a monthly, cancel any time subscription box that sends you between 9 and 14 foody goodies every month. As you can see from the contents, they certainly don’t disappoint. At a cost of £12.99 including P&P we can certainly say the Degustabox is good value! When you join up with Degustabox you will be asked about your preferences, ie vegetarian, do you have kids,do you drink alcohol, so the box is more tailored towards you. Just before you receive your next Degustabox you will be asked to complete a short survey about the previous box contents, completing gets you points, 100 points= a free box. Refer friends and also claim points towards your free box. 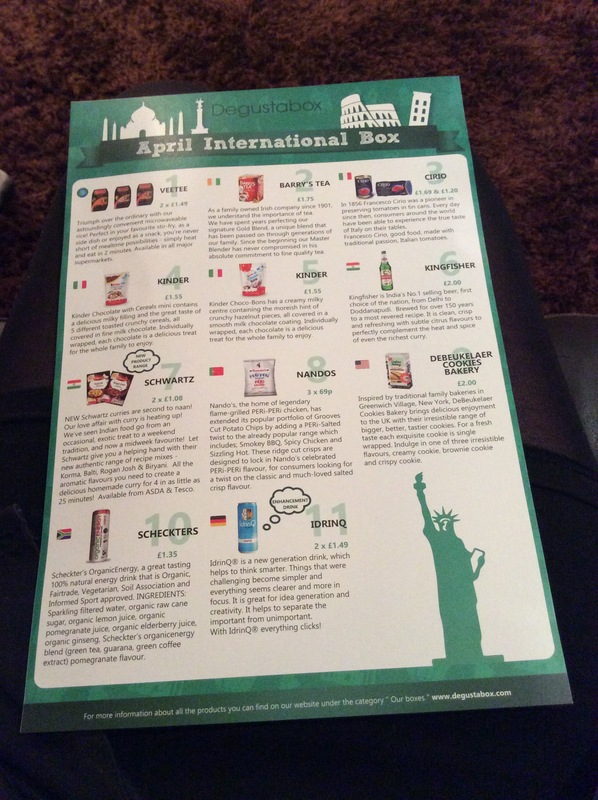 Every month the Degustabox has a different theme, this month we have The International Box…. Cirio filleted tomatoes x1 @ £1.69 a can- filleted? not sure why?! Always a store cupboard basic though! Cirio concentrated tomato paste x1 @ £1.20 for a box of 4- great idea, I have so many three quarter used tubes of this lurking in my cupboard. Kinder chocolate with cereals mini x 1 @ £1.55- these are gone. They were mine. All mine. But it’s OK because they are chocolate and chocolate comes from the cocoa plant and plants are salad so chocolate is salad. Right?! Kinder Choco-Bons x1 @ £1.55- these followed the other Kinder pouch, far too easy to eat! Schwartz curry powders x2 @ £1.08 each- Always handy! Keep them in a cupboard and when stuck for ideas you are go go go! Nandos Crisps x3 @ £0.69 each- Mmmmmm yummy. I shared these nicely. With myself. Debeukelaer Cookies Bakery x1 @ £2.00 -Cannot wait to eat these, they have a soft nougat centre, I admit without shame that I sniffed the packaging repeatedly. As biscuits go, these look pretty darn awesome. Sheckters Organic Energy Drink x1 @ £1.35- – The most natural energy drink I have ever seen! Fair trade, Vegetarian, Soil association approved! If you want to go natural, let this drink lead the way! Husband says it would mix well with gin. Sigh…. IDrinQ a new generation drink x2 @ £1.49 each- The Matrix of the box. Apparently drinking these makes your mind clearer and things that you found challenging more simple. Tasted lovely, however after drinking it first thing this morning I found it still took me 9 attempts to put my USB Key into the correct slot, so am unsure around the whole clarity thing. 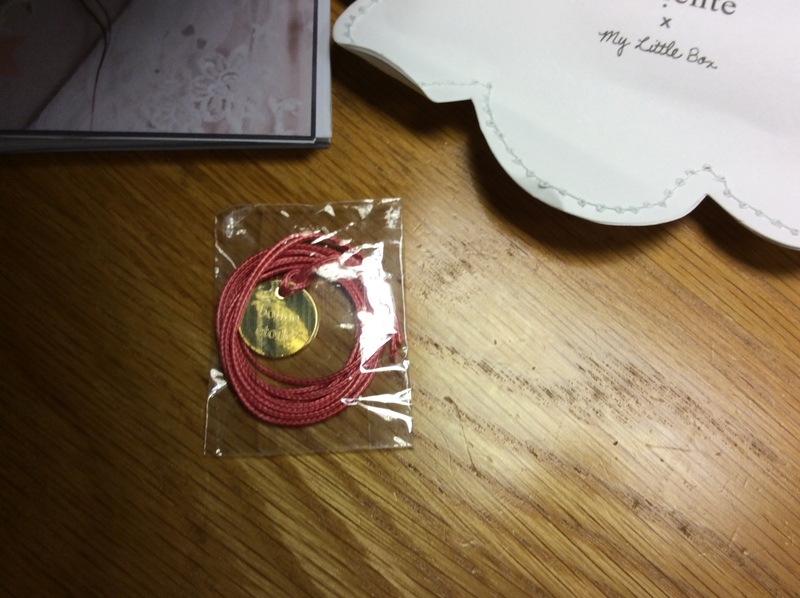 The contents are all kept nice and secure with a recyclable packaging, delivered by a courier who will email or text you with your one hour delivery slot the night before delivery. I am always very impressed with Degustabox, with excellent customer service and quality products they have kept me as a customer for over a year. If you have tried Degustabox, leave a comment below, everyone’s review counts! So, go check them out at their website www.degustabox.com , if you sign up to their newsletter at the moment you will get £5 off your first box! Have a look at our You Tube review also https://youtu.be/98ai3dNFTbM, please excuse my hair, it was one of those days….. I love subscription boxes, an awesome idea that has become a massive market here in the UK. There are so many of them! Where do you start?! Right here! Over the next few months I shall be giving you the low down on all those lovely boxes of joy, tearing them apart and giving you my personal opinion on what’s what in the subscription box world. I shall be then categorising them into sections which you can see on this page, to make it easy for you to find “The One”. Where I can find a cheeky little money off coupon I shall always post these as well. I’m off to find my first box to review. First Box is being reviewed on 30/04/2015.